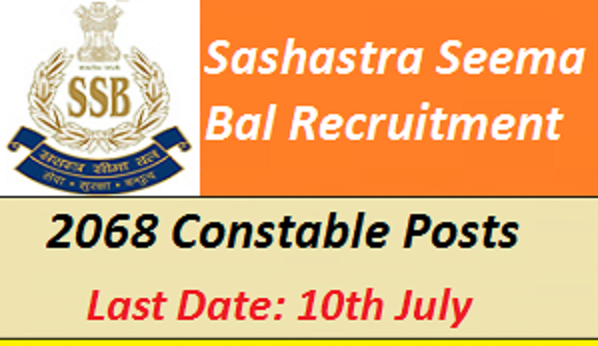 Sashastra Seema Bal (SSB) has published a Advertisement for below mentioned Posts 2016. Other details like age limit, educational qualification, selection process, application fee and how to apply are given below. Application fee: Eligible and desirous candidates should send their application formduly filled in prescribed format. General & OBC category candidates should pay examination fee of Rs. 50/- (Rupees fifty only) (Non Refundable) in the form of IPO/Demand Draft/Banker Cheque as per details given below against each. The covercontaining application must be superscribed in block letters as “APPLICATION FOR THE POST OF (NAME OF POST APPLIED)-2016”. Selection Procedure: Candidates will be selected based on Physical Standard Test (PST), Physical Efficiency Test (PET), Written Examination/Assessment, Trade Test and Medical Examination. How to apply: Interested Candidates may apply in prescribed application form along with self attested copies of relevant documents, Sports Certificates / Achievements, Two self attested recent passport size photographs, Application fee & two self addressed envelop of 11.5 cms x 27.5 cms with postage stamps worth Rs. 25/- to be affixed on each envelop send to given below address. Last Date : Within 30 days (For remote 45 Days) from the date of Advt. Published.